MSRP: Starting at $131,170 USD. 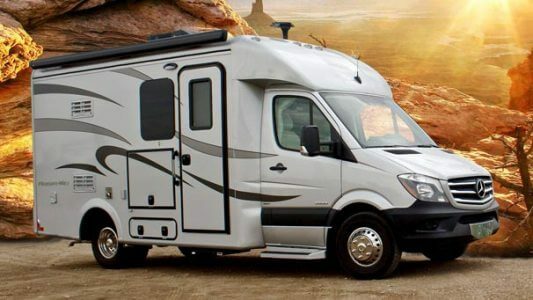 Pleasure-Way’s 2015 Plateau XL has the same Sprinter model length (22 foot) as their other Sprinter models. It is built on a Mercedes-Benz dual rear-wheel cab chassis with a 3.0 liter engine that can get up to 16 mpg on the highway, yet is a beautifully quiet ride. 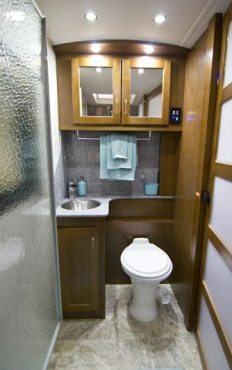 The shorter length at 22’9” allows this motorhome to be highly fuel-efficient and has excellent maneuverability. 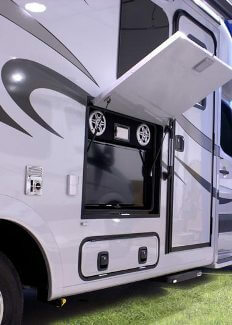 No large overhang with a great occupant and cargo capacity. The interior is spacious without the use of a slide-out. It’s also a stunning interior! There is a power sofa that is made of memory foam that has two extension drawers underneath. 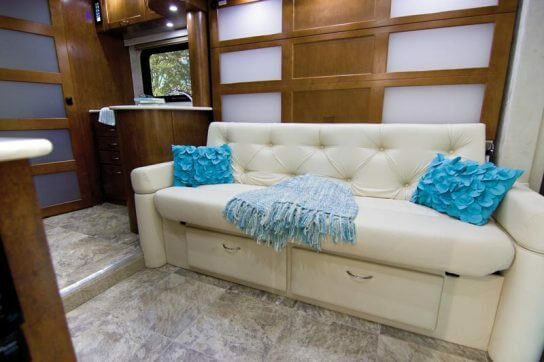 The sofa lays quickly down into a day bed or nighttime sleeping with the 60’ x 70” Murphy bed powered down over it. There is a step well cover to protect you from tumbling down the steps and adds to the safety of moving about the motorhome. The murphy bed folds back up into the living room wall keeping the living and dining areas large and roomy. The cabinetry is made in-house with solid maple doors with European hardware and positive latches. 6’8” standing height inside, a soft touch vinyl ceiling for easy cleaning, LED dimmable lighting, a skylight with a day shade and bug screen, and a 95 watt solar panel on the roof to keep your house battery maintaining it’s charge all the time. 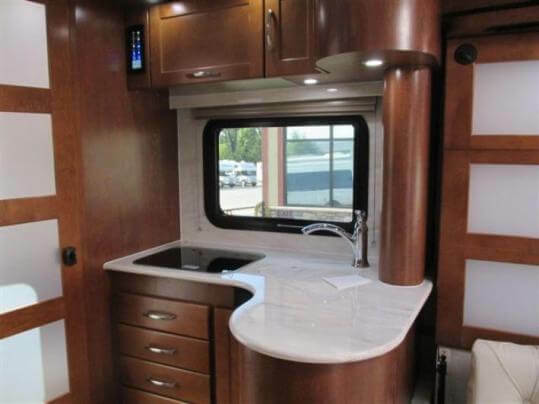 The kitchen has a Corian countertop, covered stainless steel sink, covered two burner stove, Corian cutting board, convection microwave oven, 6.7 cubic foot fridge with full swing capability, and ample cabinet storage on ball bearing glides. In addition, surprisingly huge bathroom with china commode, a window, huge vanity, stainless steel sink, waterfall faucet, 32” Corian and glass shower enclosure with an usually high ceiling, and lots of beautiful cabinet storage. The shower stall is tall enough to accommodate someone over 6’1”, with a beautiful interior with a residential feel. Outside of the bathroom is also a closet that stores a Corian table top and legs. Over the cab is a massive 86” wide storage area for sleeping bags, extra bedding, luggage, and yet another storage area that’s an upper and lower pantry. 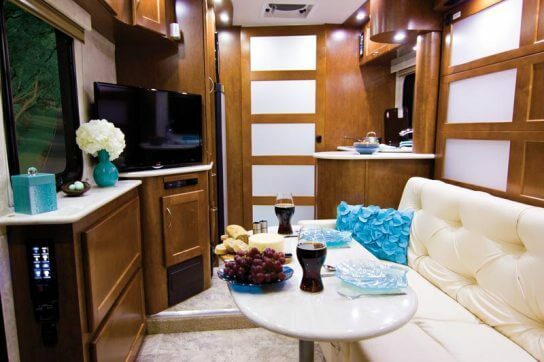 The front cab area has seating that turns completely around to face the sofa and make a complete living room area. 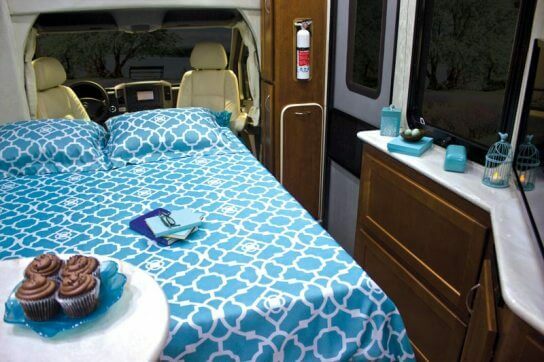 This is a wonderful motorhome for the traveler who wants a smaller vehicle without losing the amenities, storage, and space of a larger RV.